If an individual minister is unavailable to serve at a specific event, you must enter that information into the scheduler. This topic shows you how to add and delete exception dates for recurring events. To the left of family’s name. click . 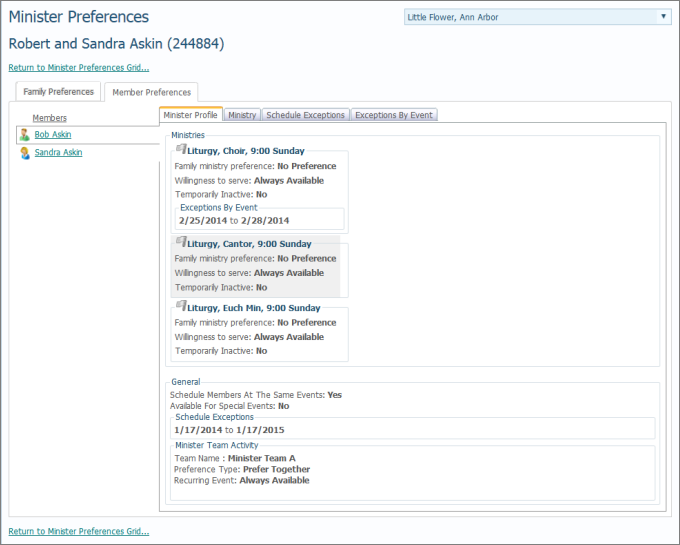 The left side of the Member Preferences tab lists the names of individual family members. Select the desired family member. Select the Exceptions by Event tab to view a member's schedule exception dates. The tab shows all of the ministry events for the selected member. The Count column shows how many exception date entries the minister has specified for each event. For example, for the 9:00 AM Sunday event in the Choir ministry, the selected member recorded one exception date. 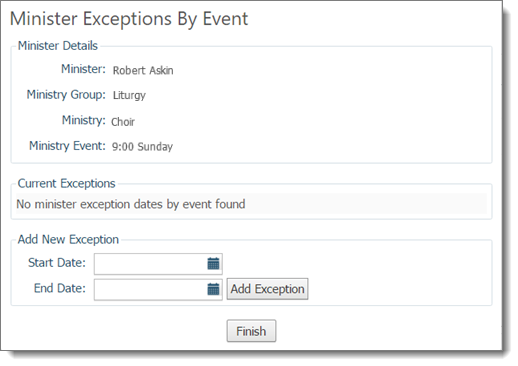 To enter a schedule exception for a specific ministry event, click the Edit link. The top portion displays the details for your selection (minister's name, the ministry group, ministry, and event). You can see that for the selected event, the minister currently has no exception dates specified. In the Add New Exception section, click and then select a date for Start Date and End Date. Click Add Exception. The date range is added to the Current Exceptions list. If you need to add another exception date for this ministry, repeat Step 6. If you are done, click Finish. The value in Exceptions column is updated to reflect the number of exception dates you now have specified for the selected ministry. Complete Steps 1-5 under Adding Exception Dates. To the left of the exception date that you want to delete, click . The date is deleted from the Current Exceptions list. If you need to delete another exception date for this ministry, repeat Step 2. If you are done, click Finish. You return to Exceptions By Event tab. The value in the Exceptions column is updated to reflect the number of exception dates you now have specified for the selected ministry.